Hi everyone. I’m back, and welcome to 2014. I have to admit that I was pretty quiet in 2013, but it was for a good reason. Embarrassingly, I had a 100% DNF rate last season…yep, I did not see the checkered flag once in the last year. This is an unusually cruel sport more often than not, and theres a good chance you’ll find yourself questioning your very involvement in the sport you love at some point in your career. A seemingly never ending streak of bad luck can really wear a person down mentally, and that’s exactly where I was last year; sitting in the infield as a race carried on without me, next to my disabled shifter kart wondering what had yet again gone wrong. Why was I doing this to myself? Brewing Beer and riding bikes is much kinder to my psyche, and a whole hell of a lot cheaper too. Fortunately, there is some light at the end of the tunnel. If you’ve had your ear to the ground in the world of karting over the last year, you should know that theres a bit of a movement forming. That is, one at the so called ‘grassroots’ level. Karting, you see, is very expensive; it is racing after all. The barrier of entry is quite high, and around here at least, the only previous entry level option was a $3,000+ (and that’s engine only, mind you) Rotax. Crazy, right? 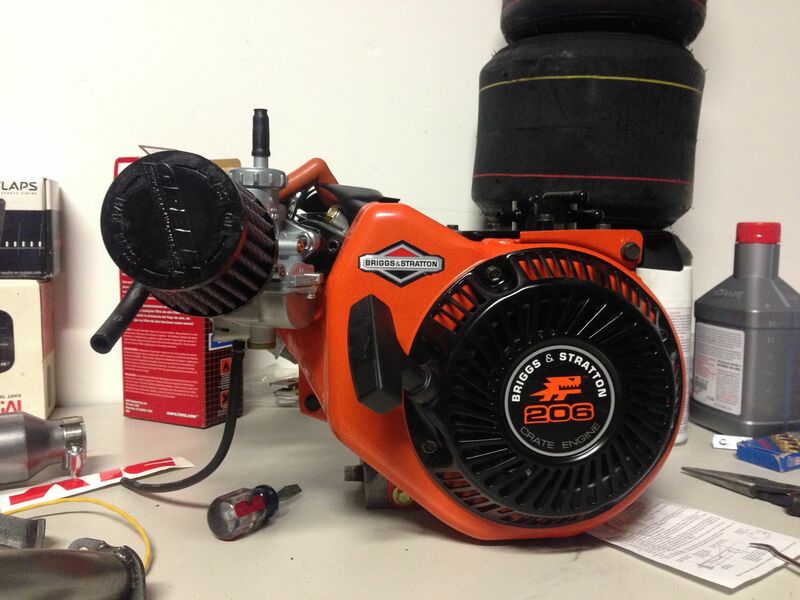 Well Briggs & Stratton (the very same that probably produces the engine on your lawnmower) has a racing division that produces a little four-stroke engine called the LO206, and it could save karting at the grassroots level. The LO206 concept is simple; a 206cc 4-stroke engine with bulletproof reliability (we’re talking years without a major overhaul), a tightly controlled rule set written by Briggs and only Briggs, and the ability to produce engines with such precision that there is next to zero performance variance between them. The result is a formula that simplifies racing and effectively takes money out of the equation and leaves the results to the skill of the driver and tuner. Add oil, gas, driver…pull the cord and go race. The best part? Buy a turn key package for under $1000 and go racing. Brand new. I’ll go into detail in a later article, but you get the idea. Our local tracks have embraced the idea and adopted the class for 2014, along with an economical tire that will last all season (no really, one set for the entire year). 206s are flying off shelves (dealers can’t keep them in stock), and suddenly that old chassis in your garage has a purpose again. Its not the fastest thing karting has ever seen (by a long shot), but that’s no matter; guys are lining up even before the first race, we have seasoned Rotax and Shifter guys (me!) itching to race them, brand new blood to the sport, and everyone in between. We should see fields with 20 entries, perhaps even 30 at some point, I haven’t raced in a field that deep in years. The racing promises to be incredibly close and competitive, and is should take racers new and old to school again on how to extract everything from their kart. Karting like it should be; maximum attack. Pure racing. I can’t wait.